The legalization of General Solicitation of private investment through SEC's Regulation D, Rule 506(c) has created opportunities for investors and entrepreneurs to connect in a more open and transparent fashion than ever before. What has been historically prohibited, is now specifically enabled with the goal of increasing investment opportunities and access to capital. With that newly created venue comes new requirements for all issuers, investors, and facilitators of the private investment transactions. Issuers of publicly marketed, private securities (generally, entrepreneurs) and security token sales (STO's) must now take "reasonable steps" to verify that all investors in their company qualify as Accredited. Self-certification of being an Accredited Investor is not sufficient when investing in Generally Solicited private securities. But now through EarlyIQ, Regulation D, 506(c) investors can be verified as Accredited with our simple online solution. The SEC offers a non-exclusive list of verification methods that issuers may use, but are not required to use. This non-exclusive list of methods includes the issuer taking “Reasonable Steps” to verify an accredited investor. By taking these “Reasonable Steps”, issuers can be confident in complying with the Regulation. EarlyIQ performs the “reasonable steps” listed above for the issuer, allowing them to comply with Reg D 506(c). For more information on our “Reasonable Steps” Process, see how our process works. Simple. Investors are verified in 3 Simple Steps (our process) in a super easy, 100% online process that takes about 10 minutes. Safe. 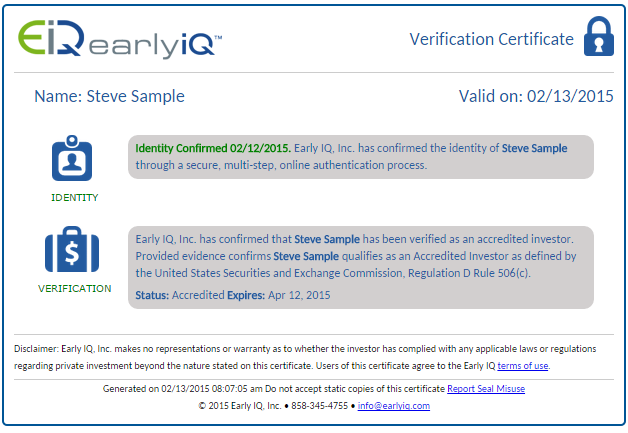 EarlyIQ goes beyond ”reasonable steps” with the only Accredited Investor Verification service offering Positive Identity Authentication to reduce fraud. Plus, Investor’s personal data remains private and is never shared with the issuer. Easy. Our platform features an Accredited Investor Dashboard where issuers can view all of their investors’ accreditation status at a glance. Cost Effective. Because EarlyIQ is automated and efficient, we can offer Accredited Investor Verifications at the lowest cost in the industry. Private. Get verified while maintaining control of your personal information. Personal data is never shared with the issuer. *Standard turnaround is maximum 2 working days from the receipt of all evidence documents. Most verifications completed same day or next day.